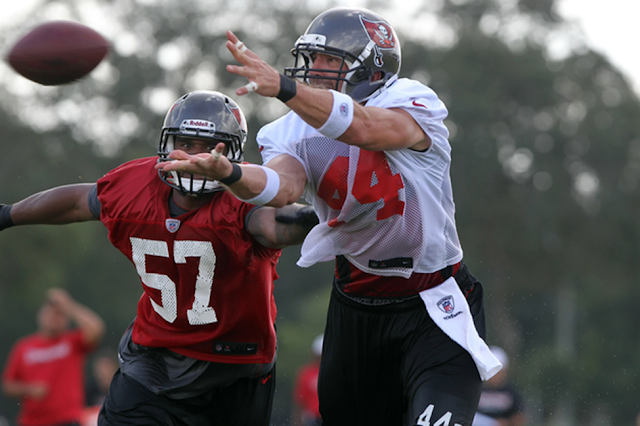 When veteran tight end Dallas Clark was signed in the offseason, both coach Greg Schiano and quarterback Josh Freeman insisted he'd be a huge part of their offense. But throughout the first five weeks, Clark, 33, was quiet production-wise, with a combined nine catches for 81 yards, including getting targeted zero times against the Chiefs. That changed in a big way Sunday against the Saints, with Clark catching a season-high five passes (on six targets) for 51 yards and a touchdown, becoming one of Freeman's favorite options in the second half comeback. Freeman indicated that coverage often dictates who gets the ball, especially the leverage of the safeties. With WRs Mike Williams and Vincent Jackson making big plays, it can open up the underneath areas for Clark. "A lot of things go into who gets the ball," Freeman said. 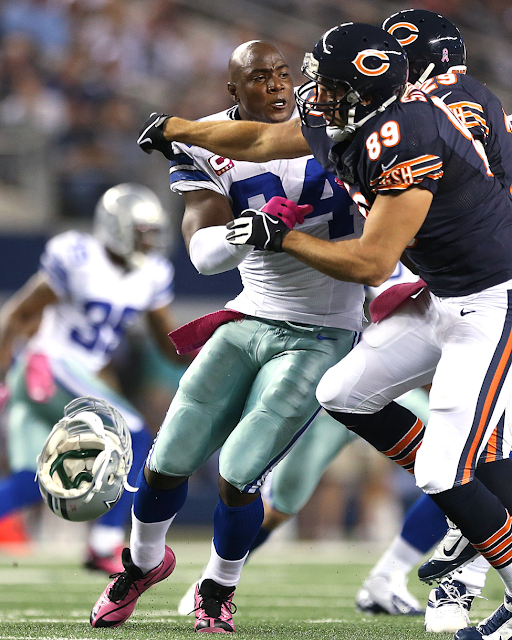 "But I know that Dallas (Sunday) did the exact same thing he has been doing the entire season. And I know it's good to see him get involved. He's a big-time playmaker late in the game when we needed a play, fourth down, he comes up big for us. I'm really happy with Dallas, and how he played and excited about the growth and the understanding of his sort of game and us sort of gelling in the future." 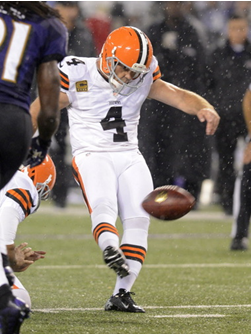 Phil Dawson just happens to be perfect on 12 field-goal attempts, and he does it through wind, snow and rain, including this kick at Baltimore last month. From Terry Pluto's "Terry Pluto's Talkin' ... Browns’ special teams doing especially well"
4. Not sure how they figure those return stats, because it seems they should be higher. Joshua Cribbs ranks third in kickoff returns at 31.3, and he's second in punt returns at 15.4. While Cribbs has yet to run one back for a touchdown and had a costly fumble in the loss to the Giants, he's having a big-time season. He's had a 74-yard kickoff return and a 60-yard punt return. 5. The kickoff coverage team has also been excellent. STATS LLC rates them No. 6. "The two big stars of this game have to be Frank Gore and Ted Ginn Jr."
Well, that game was something else. The 49ers 13-6 win over the Seattle Seahawks was truly a tale of two halves as San Francisco made some sizable adjustments in multiple phases of the game to secure a hard-fought, much needed divisional victory. The 49ers improve to 5-2, while the Seahawks drop to 4-3. More importantly for Seattle, they are 0-3 in divisional games, and even with three divisional home games left, they can do no better than .500 in the division. The 49ers could not have looked much worse in the first half, as they could get nothing going on offense, and the defense was getting gashed by Marshawn Lynch. Fortunately, the team figured some things out in the locker room and controlled much of the second half. Alex Smith threw an awful interception in the fourth quarter, but thankfully the 49ers defense stepped up big to prevent Seattle from doing anything with it. The two big stars of this game have to be Frank Gore and Ted Ginn Jr. Frank Gore thoroughly dominated the Seahawks on the ground, rushing 16 times for 131 yards. He got banged up late, but Kendall Hunter provided solid enough relief work. It was incredibly frustrating seeing the 49ers go away from the run for much of the second quarter, but thankfully they realized the error of their ways in the second half. Ginn deserves kudos, even though the 49ers only managed three points off his big punt returns. He returned three punts for 70 yards, doing a great job for a special teams unit that was looking for plays. It wasn't a pretty win by any stretch, but the 49ers gutted it out and got a crucial home divisional win. Now they have some extra rest time to get ready for an even bigger divisional road game. The 49ers travel to Glendale to face the Arizona Cardinals in Week 8. Given how this division is shaping up, the first team to win a road division game might end up as the team to beat in the NFC West. SAN FRANCISCO -- Special teams coordinator Brad Seely walked out of the 49ers' locker room "really proud" of his units' efforts in Thursday night's 13-6 win over the Seattle Seahawks. 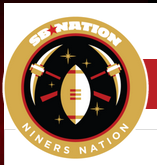 That included Ted Ginn Jr.'s familiar prowess on returns, David Akers' 2-for-2 showing on field goal attempts and, most impressive, the 49ers' suffocating coverage of Andy Lee's punts. "They stepped up and knew they needed to improve," Seely said. "Their mindset was to get the job done." Lee's final punt soared 66 yards before Tramaine Brock tackled Leon Washington after a 5-yard return at the Seahawks' 11-yard line with 1:36 left. 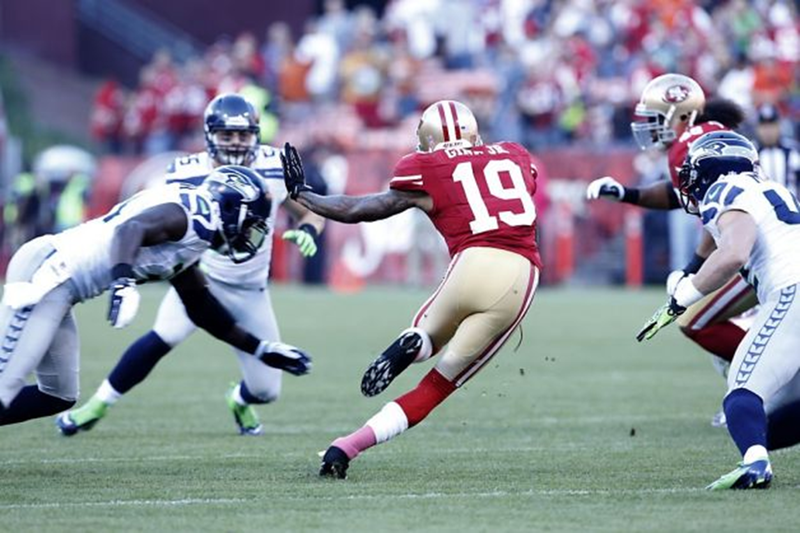 Lee's first punt was downed at the Seattle 4-yard line by Dashon Goldson. "It was lights out on the coverage teams," coach Jim Harbaugh said. "And Ted Ginn had a great game." Ginn averaged 23.3 yards on three punt returns and 20.5 yards on two kickoff returns, stirring memories of last season's opener in which he scored fourth-quarter touchdowns on kickoff and punt returns against the Seahawks. "It was fun to see Ted get in the flow of things, and he really helped the field position," Seely said. RENTON, Wash. -- The text messages that Seattle Seahawks placekicker Steven Hauschka has received from friends in his hometown of Needham, Mass., have been a little more frequent this week with the New England Patriots coming to town. "They're wishing me the best, but not wanting us to win," he relayed Friday. "They're like, 'I hope you have five field goals but you don't pull it out.' They want the best of both worlds." Tough crowd. But it's all in good fun for Hauschka, who grew up admiring Patriots kicker Adam Vinatieri, has an autographed picture of Vinatieri's famous snow bowl kick, and understands the passion of New England fans because he was once one of them. But these days, he views the matchup against his hometown team as pure business. "In the past five years, everything has kind of changed since I've been playing. The allegiances change," he said. "Obviously, I'm the biggest Seahawks fan now. It seems like every week there is something new, you're playing an old teammate, an old coach, you're playing in a town where you know everybody, or an old team. You kind of get used to all those distractions and it's football at the end of the day." 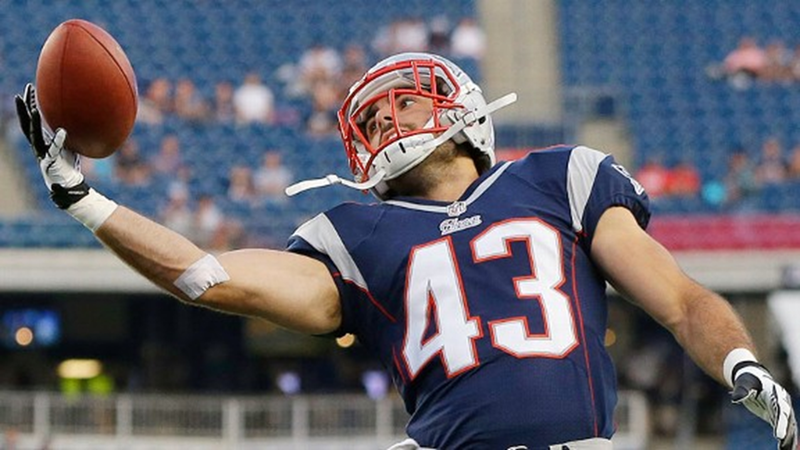 Like teammate Breno Giacomini, who grew up in Malden, Mass., and first started cheering for the Patriots when quarterback Drew Bledsoe was drafted in 1993, the 27-year-old Hauschka reflected Friday on attending his first Patriots game in the 1990s when Scott Zolak replaced Bledsoe and led the team to victory. Fast-forward 20 years later, and this time it will be Zolak watching Hauschka, providing analysis for the Patriots' radio broadcast at CenturyLink Field on Sunday. "I like the matchup. 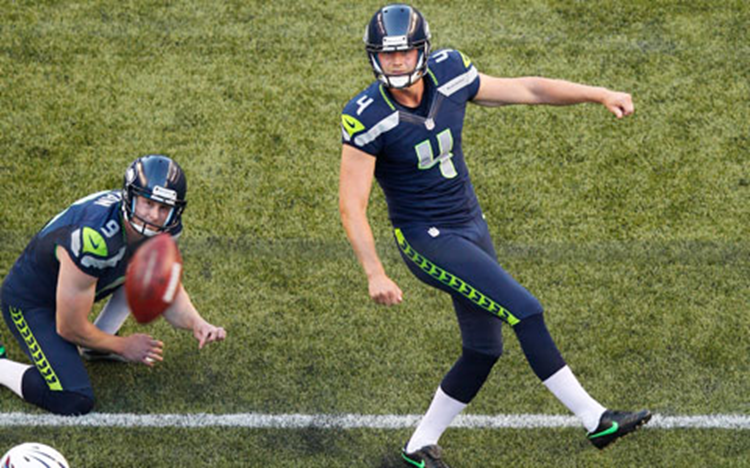 They are obviously a great team but I think our team fights hard to the end," said Hauschka, who has made 51 of 62 career field goal attempts, and is 10-of-11 this season. "We have a tough stadium to play in. Anything can happen in that stadium." For Hauschka, who is expecting only a few friends in town for Sunday's game, breaking through in the NFL has been a long journey. It started at Middlebury College, then N.C. State, while his NFL resume includes mostly brief offseason and preseason stints with the Minnesota Vikings, Baltimore Ravens, Atlanta Falcons, Detroit Lions and Denver Broncos. There was even a stop with the Las Vegas Locomotives of the United Football League. He joined the Seahawks at the start of last season, and this is as close as he's had to a secure regular-season job in the NFL. "I just stayed on course and kept kicking, and knew I would get another opportunity. You just have to make the most of that opportunity," Hauschka said, adding that a big part of his breakthrough has been trusting his abilities, treating every kick the same, and developing a rapport with snapper Clint Gresham and holder Jon Ryan. "Steven has been really consistent for us," head coach Pete Carroll said. "He's a very smart kid, great worker, big kid for a kicker (6-4, 210). He's just been very effective and hopefully we can just keep him knocking them in. We haven't asked him but just a couple times to have to bomb any kicks, but his consistency has been excellent." Wow! Browns’ win in the wind is a wonderful windfall. 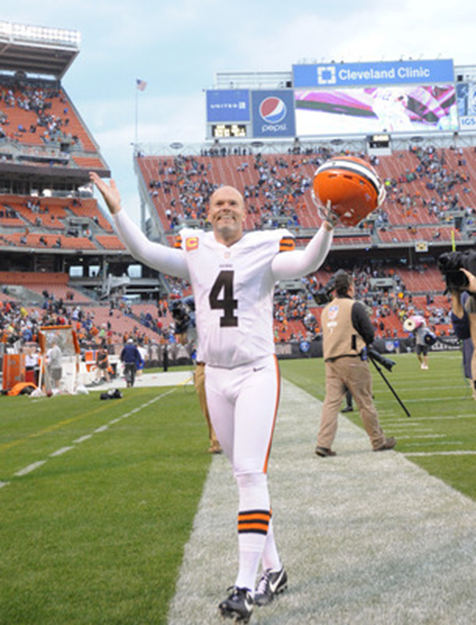 In that whirling wind, Phil Dawson kicked field goals of 38 and 41 yards. The amazing Dawson is now 12-of-12 this season. Maybe, just maybe, he will finally make a Pro Bowl. Punter Dave Zastudil launches a kick Thursday night against the Rams. Dave Zastudil’s right knee was finally feeling better during the summer of 2011. It had been 21 months since he last punted in an NFL game, a 49-yarder against the Chicago Bears on Nov. 1, 2009 that Devin Hester returned for 69 yards. 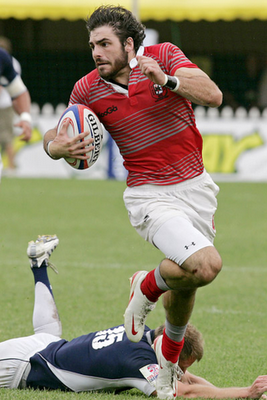 Zastudil spent those months recovering from a knee surgery that shut him down midway through the 2009 season through the balance of 2010. Years of planting his right leg before kicks had caused tendonitis, which resulted in dead tendons. They wouldn’t rebuild or regenerate on their own and by the bye week in 2009, with eight games left in the season, Zastudil couldn’t bear the pain anymore and opted for surgery. Doctors had to rupture his patella tendon during surgery in order to reattach it. “The only thing that made it OK was that I knew I couldn’t play. Physically I couldn’t do it,” said Zastudil, who faced a long recovery period. “It was hard. You miss the locker room, you miss the guys, you miss the lights, the atmosphere and the game. I missed that. The Houston Texans wanted to try out Zastudil, and flew him to Texas last summer. The workout was going well, Zastudil said, until he tweaked his oblique muscle. Zastudil left Texas and headed home to Ohio without a job. For the first time in his career, he thought he may never play football again. As the special teams coach for the Pittsburgh Steelers, Kevin Spencer watched AFC North rival Baltimore draft the punter out of Ohio University in the fourth round in 2002. But Spencer wasn’t a Zastudil fan just because he was among the top five punters in college or because he was an All-American. What stood out most to Spencer was that Zastudil was one of Ohio’s captains. Zastudil had punted against Spencer-coached teams 49 times since 2002, averaging 40.8 yards per punt. He dropped everything and jumped at Spencer’s offer to join the Cardinals late in training camp. Life was breathing back into his then-33-year-old legs but he came with questions. The job wasn’t handed to Zastudil. He had to earn it. His first opponent was the Cardinals’ incumbent punter, Ben Graham. Zastudil won the starting job and punted a career-high 87 times last season, averaging 45.2 yards. His 3,929 yards were also a career high by almost 300. His season average and season long of 66 yards were both the second best of his career. Zastudil answered his questions but he still wasn’t where he wanted to be. With a full offseason ahead of him, Zastudil dedicated himself to training his body and his mind. Listening to former Mike Tyson trainer Teddy Atlas, Zastudil heard something that stuck with him. He let go of any doubts that filled his head, whether about his health or ability. He stopped paying attention to numbers and stats, except for one: field position. And he made a few tweaks to his technique with the help of former NFL punter Chris Gardocki, who spent time at training camp in Flagstaff and still advises Zastudil. Zastudil ranks seventh in the NFL in net punting average at 42.4 yards per punt and is first in total punts (33), total yards (1,556) and punts downed inside the 20 (12). Zastudil doesn’t throw the ball or catch it. He doesn’t cover receivers or rush the quarterback. He doesn’t score. But Zastudil may be the most important player on the Cardinals’ roster. 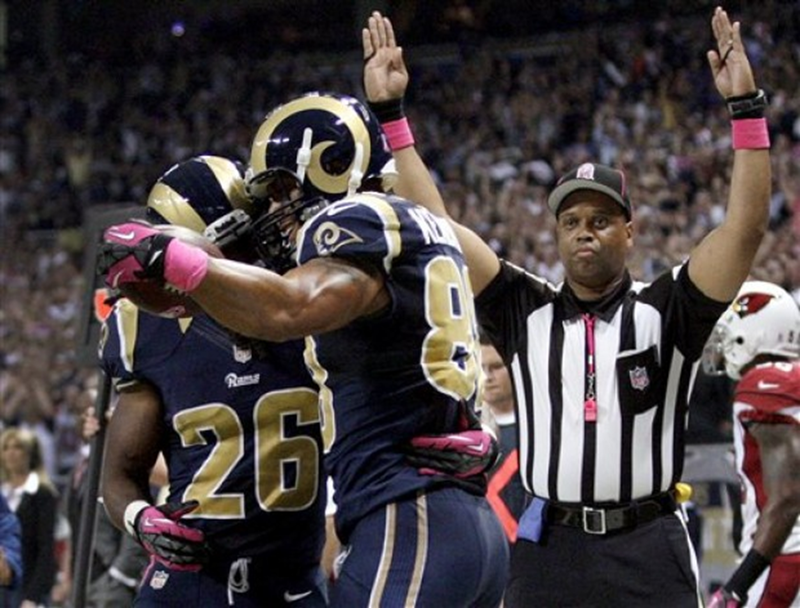 He punted seven times Thursday night against the St. Louis Rams, and all but one pinned the Rams on their side of the field. The one that didn’t was returned to the 50. Of those six, three punts forced the Rams to start from their own 8, 4 and 11-yard-line, respectively. Zastudil saw what life after football could’ve been like. He felt the emptiness of not driving to the stadium on Sundays. He felt the adrenaline tug at him. He tasted the football afterlife and didn’t like it. “I think it makes you appreciate the game more,” he said. “Being out for a year, year and a half, you realize what you’ve missed. Zastudil has always been preparing for life after football. 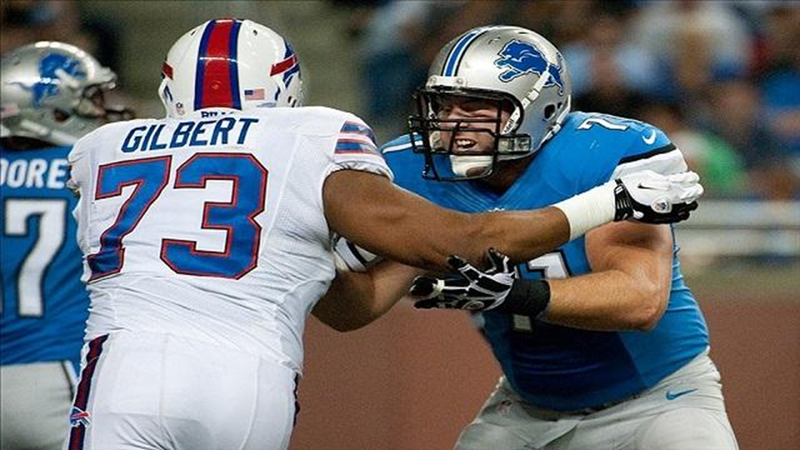 In 2006 and 2007, Zastudil took classes at the Wharton School at the University of Pennsylvania and at the Kellogg Business School at Northwestern, respectively, through NFL programs. He interned in a fixed income department while playing in Cleveland. He’s seen teammates lose money on bad investments and he wants to be prepared. Zastudil majored in finance at Ohio and is leaning toward a career in it after he retires. 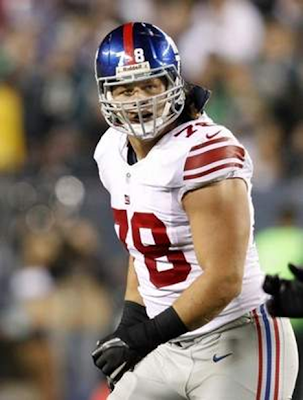 Rookie Markus Kuhn will make his first career start in place of an injured Rocky Bernard today against the Browns. The Giants declared five players out by Friday and two more were ruled doubtful so there wasn't much suspense over who would be the seven inactives today against the Browns. The Giants officially announced the inactives for their matchup against the Browns today and the seven expected to be out today are the ones not suiting up. The only two who had a chance -- slim, at that -- of playing were LB Keith Rivers and OT David Diehl. But they're inactive. It'll be the third straight game Diehl's missed since spraining his MCL against the Buccaneers in Week 2. Rivers also missed last week's game against the Eagles. Like in recent weeks, Sean Locklear will start at right tackle and Will Beatty will get the start at left tackle with Diehl out. Rocky Bernard is out with a quadriceps injury so 26-year-old rookie Markus Kuhn will make his first career start. Expect to see plenty of Jason Pierre-Paul and Justin Tuck in the interior as well. Kenny Phillips sprained his MCL last week and Stevie Brown will start in his place. The Giants had the option to activate Tyler Sash, coming off a four-game suspension, for today's game, but decided not to. They would have had to waive another player to make room on the 53-man roster. The Giants have until tomorrow at 4 p.m. to activate Sash. If they don't, Sash will be waived. The Arizona Cardinals defense has gained most of the credit for the team’s perfect record. However, lost in the accolades is the fact that their punter, Dave Zastudil, and their field goal kicker, Jay Feely, have both been superb. Punters are the Rodney Dangerfield of the NFL — they get no respect. But let’s give a little credit where credit is due. Zastudil has punted 26 times, and 9 of those kicks have landed inside the 20-yard line. He’s forced 9 fair catches, and when opponents do rerturn a punt, the yardage gained has usually been minimal because his punts are high. He’s averaging a solid 47.5 yards per kick, forcing Cardinals opponents to start with poor field position almost every time he punts. He was particularly good in the Cardinals last game against the Dolphins. 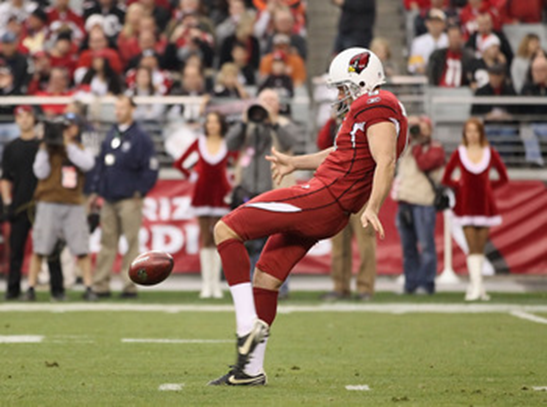 Kicker Jay Feely has been perfect in his seven field goal tries this season. In fact, he has nailed 18 in a row going back to last season. He hasn’t tried any 50-plus yard field goal this year, but he has kicked several 40-plus yarders through the uprights. And he also has been perfect on his extra point tries. It’s nice to have a punter and a field goal kicker that are both so consistent and reliable. 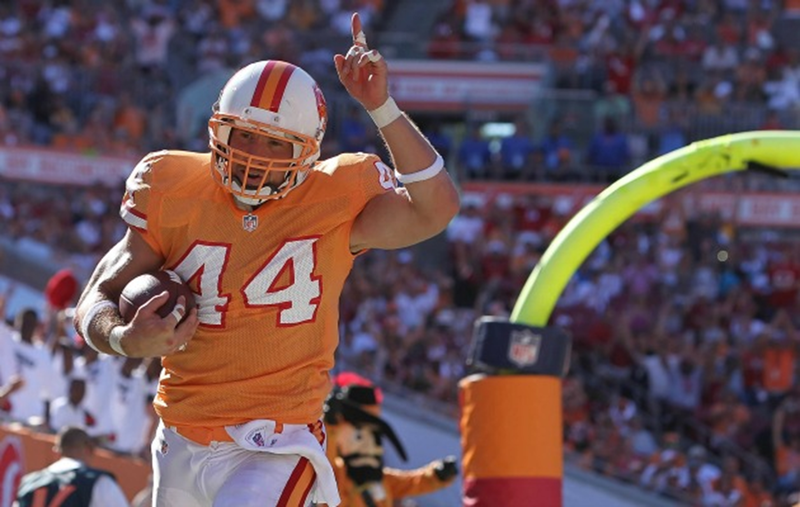 Viscos LLC, the maker of the joint solution, Play Again™, has announced today that it has named professional football player, Dallas Clark, as the first Play Again Brand Ambassador. “Oftentimes, we see retired athletes suffering from severe joint pain. With the issues I was having with my knees, I was concerned about my future career as a football player and was worried that I too would suffer the same fate as these other athletes,” explained Dallas Clark. “After starting Play Again at the suggestion of my doctor, I began feeling much better. Without a doubt, Play Again has helped my knees feel great and has given me the joint support I needed to become more active on and off the field,” he added. Introduced in 2012, Play Again is a unique and revolutionary viscosupplement consisting of high molecular weight hyaluronic acid (HA) patented for the relief of joint pain and discomfort due to arthritis and fibromyalgia. HA is the main ingredient in healthy joint fluid. Play Again replenishes HA as the aging human body stops producing it. “We are pleased to introduce Dallas Clark as our first Brand Ambassador,” commented Debbie Ecksten, President of Viscos LLC. “As both a dedicated Play Again user and our first Brand Ambassador, Dallas will be an invaluable addition to our team as we raise community awareness about Play Again during our launch into retailers this fall,” she added. “Play Again is an amazing product that will help so many people. As the first national Brand Ambassador, I am excited to tell everyone about Play Again so that they will hopefully take it and enjoy the same benefits that I have personally experienced with my knees,” concluded Dallas. 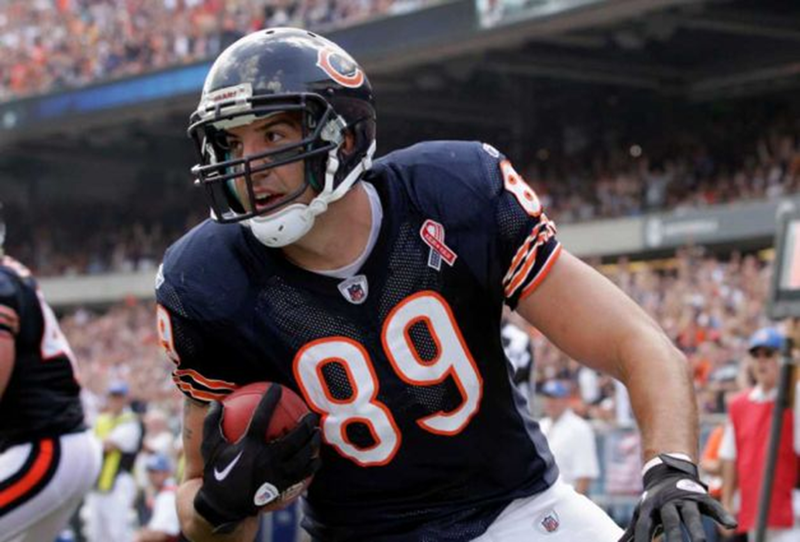 LAKE FOREST – For much of his six-year career, Matt Spaeth has hidden in plain sight. The Bears’ blocking tight end came out of anonymity for at least a few minutes Wednesday as quarterback Jay Cutler praised him for his role on the team. Spaeth was on the field for 60 percent of the offense’s snaps Monday against Dallas, and he helped J’Marcus Webb in pass protection while also filling in for injured teammate Evan Rodriguez as a run blocker. “He’s a wild card in our offense,” Cutler said. “He moves around a lot. We ask him to do a lot of different roles in the passing game and the running game. Spaeth said he appreciated the compliments, but he was fine without being in the headlines. “To be honest with you, I don’t really care if I don’t get the credit,” Spaeth said. “I want to be out there, I want to play football. My thing has been, since I’ve been here, I’ll do whatever they ask me to do." Spaeth also can be effective as a receiver, although that is not his primary responsibility. He has caught 44 passes for 329 yards and seven touchdowns in six seasons, which included 60 games with the Pittsburgh Steelers and 19 games (and counting) with the Bears. The Arizona Cardinals' overtime victory against Miami in Week 4 was remarkable on several fronts. We discussed many of them after the game. Two special-teams aspects went relatively unexplored. One, field goal kicking has improved to the point that Jay Feely's winning 46-yard kick wasn't a big part of the story. Missing from that distance in that situation would have commanded more attention than succeeding commanded. We expect NFL kickers to convert from that range (and if you're a St. Louis Rams fan, you expect to convert from much, much longer). 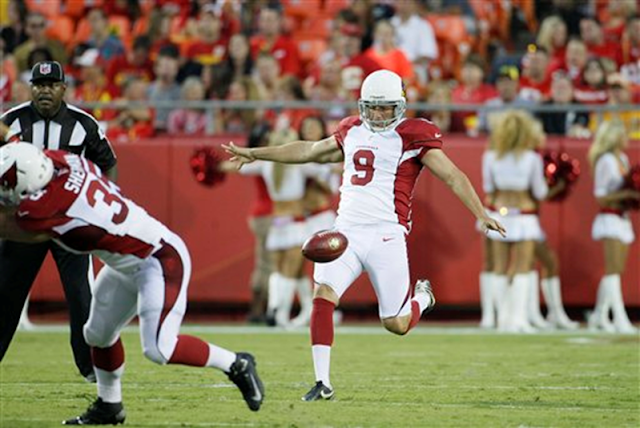 Two, Cardinals punter Dave Zastudil and Arizona's coverage team helped swing field position. As noted last week, ESPN's Mark Simon tracks and honors the best NFL punters each week. Dave Zastudil was the busiest punter in the NFL this past weekend. He was also the league’s best punter. 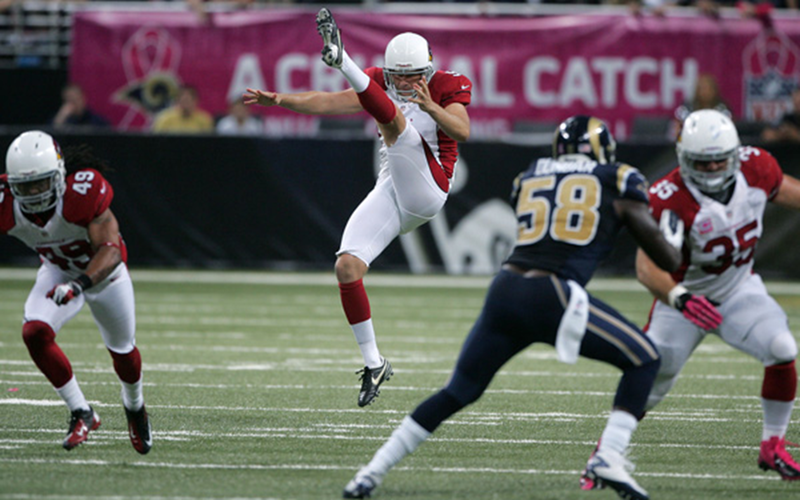 The Arizona Cardinals veteran is our selection for Punter of the Week for Week 4. Zastudil’s had a career-high nine punts in the Cardinals overtime win of the Dolphins. Eight of the nine punts resulted in an increase in the Cardinals win probability for the game (it’s also worth noting with that that all nine of the punts came with the Cardinals losing or tied). Zastudil’s average punt helped the Cardinals chances of winning 3.3 percent, the best average in the league for the week, the fourth-best by any punter in a game this season. That included punts that netted 51 and 48 yards in the fourth quarter and overtime that each increased the Cardinals chance of winning by 4.7 percent. Seven of Zastudil’s nine punts were either downed, out of bounds, or fair caught. Zastudil got credit for three punts on which the Dolphins ended up with field position inside their 20-yard line, but also had three more in which they were on their own 21 or 22, and another in which a holding penalty on the return pushed Miami back to its 11. In the last 20 seasons there have been 354 instances of a punter punting at least nine times in a regular-season game. Zastudil’s 47.3 gross punting average rates second-best among them, trailing only a 49.6 yard average from Dolphins punter Brandon Fields against the Jets in 2010. 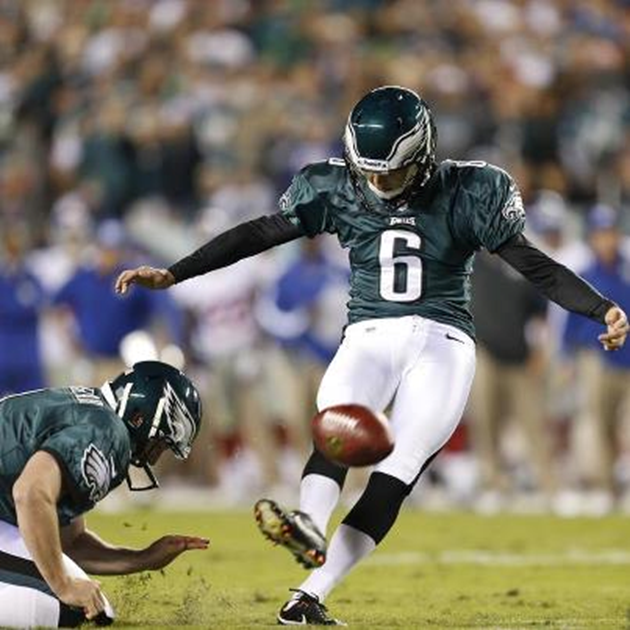 Four field goals on Sunday night in the Eagles' win over the Giants made Alex Henery 8-for-9 on the season. 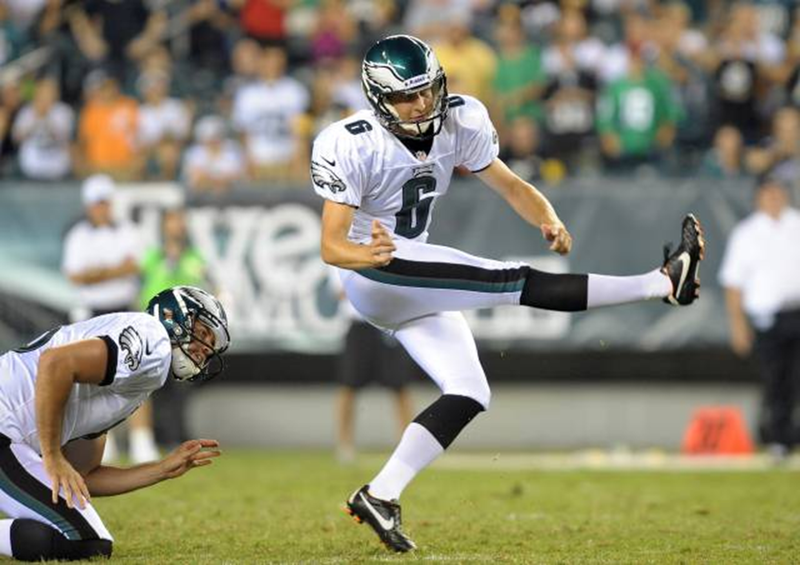 Alex Henery makes clutch fourth-quarter kicks all the time. They just happen at practice and in his mind more than they actually take place in real games. Henery was the rare offensive hero for the Eagles on Sunday night against the Giants, as he made all four of his field goal attempts to account for 12 of the team’s 19 points. His 26-yarder with less than two minutes left in the fourth served as the game-winner in the Eagles’ 19-17 win. Henery also made kicks of 25, 48 and 35 yards. The 48-yarder, his longest this season and second-longest of his career, put the Eagles up 13-10. Considering that he spent the week practicing with a new holder (punter Mat McBriar) and long snapper (Kyle Nelson), those are some impressive numbers. Making his game even sweeter were two misses from his counterpart, Giants kicker Lawrence Tynes, from 54 yards out in the final 15 seconds. Tynes missed wide left on the first attempt, which came off his foot mere seconds after Eagles coach Andy Reid called timeout to ice the veteran. Tynes then came up short on his second attempt. Tynes is one of the NFL’s most clutch kickers. He kicked the overtime 31-yarder in the Giants’ 20-17 win over San Francisco in the NFC Championship earlier this year to become the first player in league history with two postseason overtime makes. His other, a 47-yarder, came in the Giants’ upset of the Packers in the 2008 NFC title game. Henery, a fourth-round pick last year, is still carving his reputation after being drafted to replace David Akers, the franchise’s all-time leading scorer who signed with San Francisco last season after the Eagles let him walk. Henery made 24 of 27 kicks as a rookie, setting a franchise accuracy record (88.9), and was the most accurate rookie kicker in NFL history. Not many Eagles games have come down to Henery in the final minutes, but he prepares each week like it's inevitable.